The 5-year long saga of police sergeant Lynn Edward Benton finally came to an end last week when he was sentenced to life in prison for his role in the death of his wife, Debbie Higbee Benton. Both Bentons were well known in the small Portland suburb of Gladstone, Oregon. Higbee Benton was a long-time small business owner and Sgt. Benton was on the city’s police force for 20 years. They met in 2008 and married in 2010. Just prior to getting married, Benton began transitioning which apparently lead to a deterioration in their relationship, including domestic violence allegations. Prosecutors said Benton offered his long time friend money to have his wife killed. In May 2011, Higbee Benton was found dead in her place of business. The verdict last week came after 5 years of twists and turns. Benton, however, was in jail during most of that period. There is no word on whether Benton will appeal. The two other people involved in the murder have yet to go to trial. This drama unfolded like a bad television show. Those of us in the local area had a hard time believing Benton would be involved in such a crime. No rational police sergeant bent on committing a crime would have hired such bizarro characters to carry out the dirty deed — or so we thought. 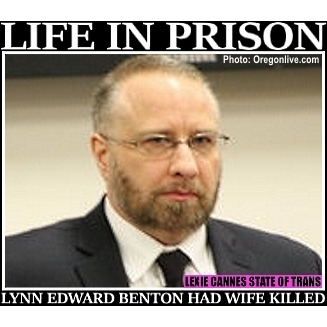 On the upside, the local media, for the most part, did not exploit Benson’s status as a trans person. I’ve read bits and pieces about the events surrounding this sad murder. Yet I’m still totally confused about the events as they played out. I guess that is why it took five years for this case to be resolved in the courts, everyone must have been confused. The fear I really have is society will see what has happened in this case and try to equate this to everyone within the transgender community. i have one dear transgender friend who recently moved to the Portland area and hope she doesn’t suffer any community backlash because of this murder. Well that goes for the whole transgender community too. I read about this case. It shows trans people, although with some special problems of social injustice, are still like everyone else. I used to believe strongly in capital punishment but as I’ve become older taking a life for a life is beyond justice. Besides too often mistakes are being done during the investigation process. Look at how many people in the last few years are being found not guilty after spending half of their lives behind bars. Thank you, Lexie. It looks like you’re writing with an even hand.